0% house edge Blackjack and 0% house roulette, what’s a difference in casino profitability? Let’s say we all already agree that even with 0% house edge casino can be profitable. That is completely true, but not with all the games. With card games such as blackjack it is all good, but it is different story with roulette. In order to understand the difference, we need to dive deeper into a concept of house edge. 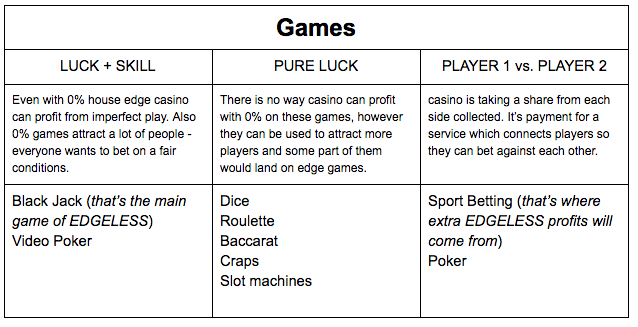 All gambling games have the advantage that the house (The person or company offering the bet) has over the players, it is called the edge. This usually varies from game to game, and to some degree, from place to place. The house edge is expressed through percentages. A 5% house edge means that, on average, you will receive back 95% of the money you bet over a period of time. For example, if you were to bet $100 (20 bets of $5 each), you would, on average, have $95 left when you finished the run. In other words, if you bet on these conditions your odds are 5% lower than casinos. Now let’s separate different game categories. Games of PURE LUCK vs games of LUCK+SKILL. For example, the roulette is a game of PURE LUCK — players don’t really have any options which can influence their edge against the house. Player decides on a bet size and amount of risk he or she wants to take. The wheel is then spined and it decides the final outcome. However, wheel has extra 1 or 2 green zeros which gives an advantage to the house and static probability edge over the long run. If roulette would take out green zeros and offer 0% edge there is NO WAY game can be profitable over the long run. Blackjack House has a 6 card. If player will play THE PERFECT game, without any mistakes in Edgeless casino, they can achieve 0% house edge, but that’s not the case for an average gambler. An analogy can be taken from poker. A new player is playing against a Pro. Both have equal probability conditions — 50% vs. 50%. However, the Pro player makes better choices and the new player makes bad decisions, and in the long run, the Pro wins. In our case casino plays an ideal game, an average player does not — he loses over the long run. To sum up, games that are offered by Edgeless casino are focused on LUCK+SKILL games so that casino can attract a lot of new gamblers and be profitable even with a 0% house edge. Afterwards, we plan to land decent amount of players who came for 0% house edge to bet on sports betting which has 4% ROI of wagered sums.